Well happy Monday, I hope it treated everyone well. Mine was okay, but I felt pretty scattered at work trying to get back into the grind while mentally preparing for the holidays. Monday’s aren’t typically my most productive days, so adding a layer of holiday complication did not help! Luckily I got it together by dinner time. :-) Last night I threw a cup of dried chickpeas in the fridge to soak overnight with no real idea of what I was going to do with it, I figured I’d cross that bridge when I got there. :-) When I got home, I was craving something curry and hot and hit AllRecipes for inspiration. Well, hammering chickpeas into the ingredients for main dishes only produced 25 recipes and I wasn’t feeling most of them either missing too many of the ingredients or the recipes taking way too long for a week night. This was the only one that peeked my interest to veganize and economize for what I had in the kitchen. As is, it seemed like a gut bomb to me packing ground meat and chickpeas. And I didn’t have canned coconut milk or canned tomatoes. But I do have fresh tomatoes, shredded coconut and a blender so here we go! 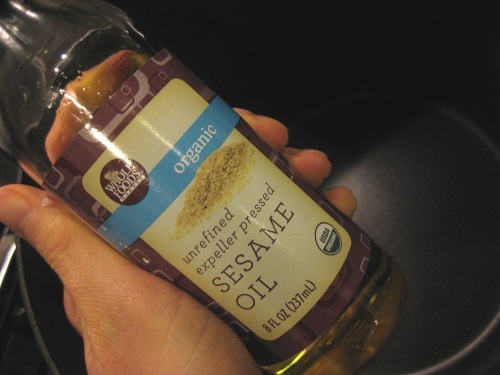 Heat sesame oil, onion and garlic in a large soup pot over medium heat until onions are transparent. 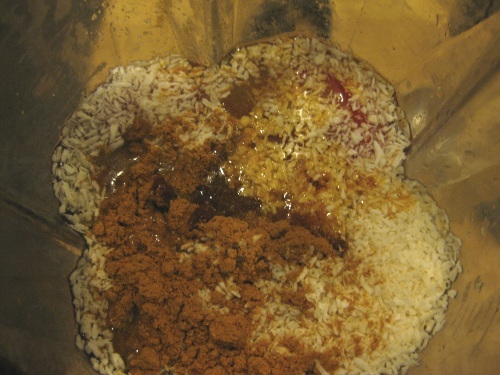 Meanwhile, place tomatoes, sun dried tomatoes, coconut, curry and water into a high speed blender and blend until thoroughly mixed. 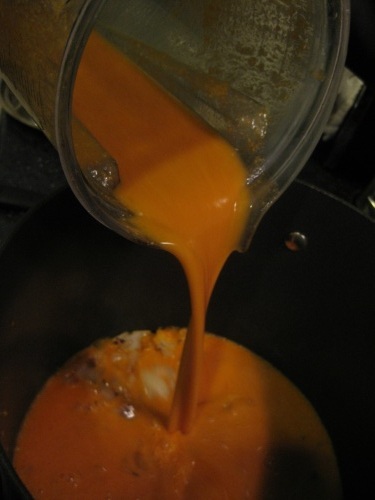 Pour blender contents into the soup pot. 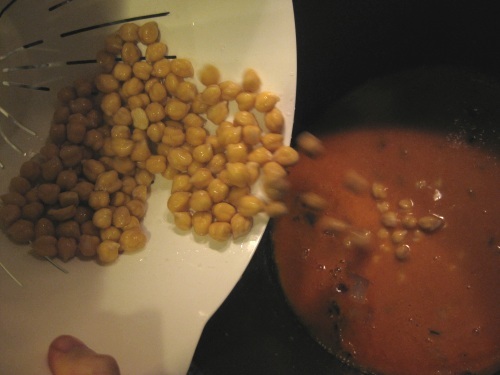 Add chickpeas and bring mixture to a boil. 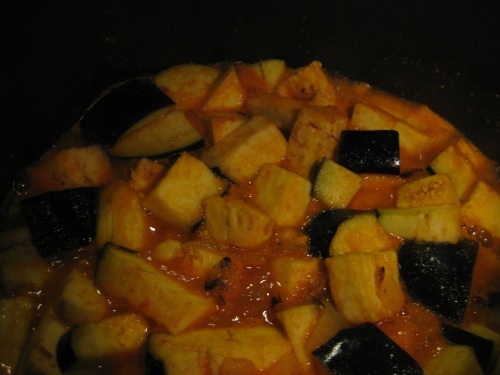 Reduce to medium heat, add eggplant, cauliflower, cilantro and nutritional yeast. Simmer covered for 40 minutes. Then serve. Makes 4-6 servings. 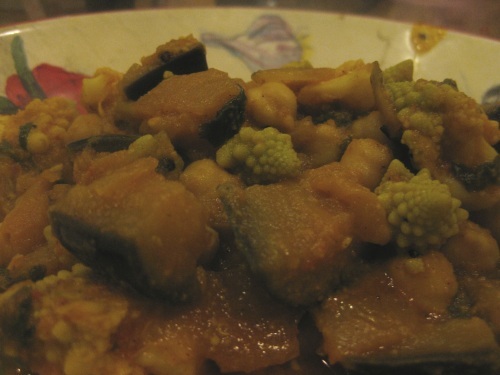 I used romanesco broccoli in place of the cauliflower because it’s a lot like it texture and taste wise and I still had some left from our last CSA box. 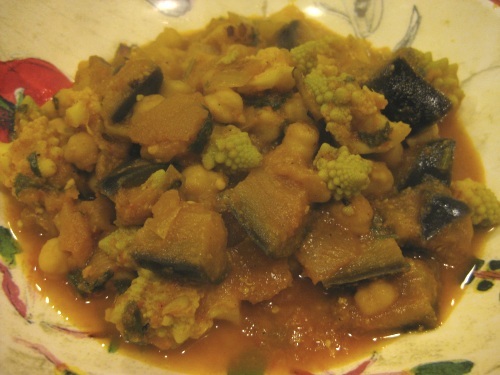 The curry flavor was great accented with a mild coconut flavor and the varying texture of the eggplant, cauliflower/broccoli and chickpeas made it a filling and satisfying stew with and underlying creamy flavor thanks to the nutritional yeast. Some may want to add more salt, I tend to be an under salter figuring it can be added at the table if needed. 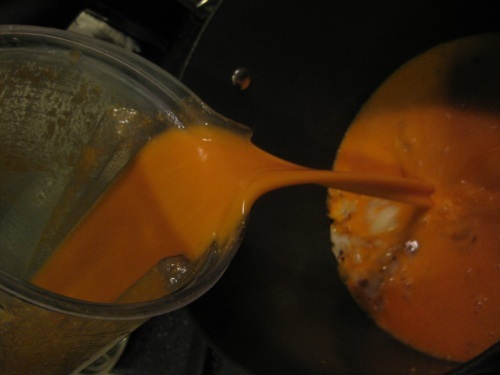 :-) It’s a great soup base to throw just about any veggies into – carrots, celery, peppers, and whatever else you need to use up. If you’re a curry fan, give this one-pot meal a try. Me too, especially the last few weeks – I’ve been craving tons of curry! Must be the cold weather. allrecipes needs to be consulting YOU, not you consulting them :) this is super inspirational..espi considering that you threw it together, on a whim, and basically came up with it all on your own. I agree almost any veggie will work in any kind of soup/stew but most ppl dont think creatively. Clearly you do! 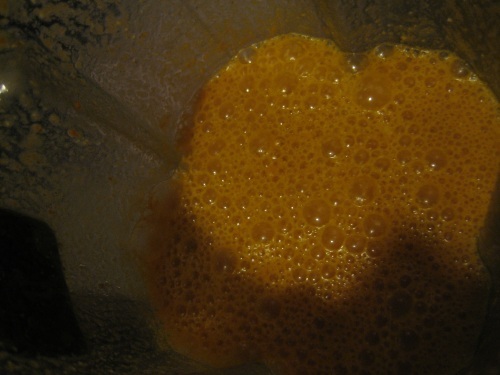 I love that you blended the coconut in the vita and pureed that w/ other things, THEN added that to the soup/stove and then at the end hit it w/ veggies. 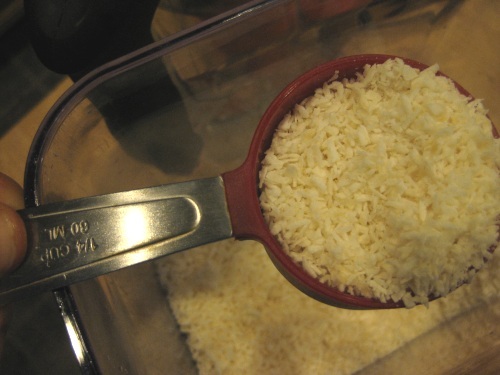 If you ever want a fast one w/ coconut and chickpeas, i relinked my coconut rice dish today. And made a pineapple/citrus stir fry..totally thought of you when i was making it! Aww, thanks! :-) Your rice dish does look fabulous! I’m the same way about salt, especially after hearing Cherie Soria speak about the importance of a low-sodium diet. Of course you can use the pic, I’ve been having so much fun with the broccoli and probably would never have bought it if on my own. Looks great…such a perfect winter meal. Thanks, I’m always craving hot soups, stews and chilis in the winter and they’re so fun to throw together. Thanks, the Vita-Mix is boss for using vegetables and other healthy ingredients as sauce bases. Anything chickpea and curry gets an A+ in my book!